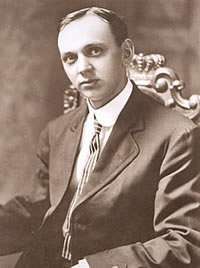 In the mid-nineteenth century, Modern Spiritualism became prominent in the United States and the United Kingdom. The movement's distinguishing feature was the belief that the spirits of the dead could be contacted by mediums to lend insight to the living. The movement was fueled in part by anecdotes of psychic powers. One such person believed to have extraordinary abilities was Daniel Dunglas Home, who gained fame during the Victorian period for his reported ability to levitate to various heights and speak to the dead. ↑ Matthew Nisbet (May–June 1998). "Psychic telephone networks profit on yearning, gullibility". Skeptical Inquirer. ↑ "FTC Charges "Miss Cleo" with Deceptive Advertising, Billing and Collection Practices". FTC. February 14, 2002. ↑ James Randi (1982). Flim-Flam! Psychics, ESP, Unicorns, and Other Delusions. Prometheus Books. pp. 173–195. ISBN 0-87975-198-3. 1 2 Gracely, Ph.D., Ed J. (1998). "Why Extraordinary Claims Demand Extraordinary Proof". PhACT. Retrieved 2007-07-31. ↑ "Psychic Debunking". NOVA. Season 19. Episode 3. April 15, 1993. PBS. ↑ "She Told Them Boy was Dead. Crystal Ball Fails Psychic in MO. Kidnap". NY Daily News. New York. January 18, 2007. ↑ Shari Waxman (June 13, 2002). "Shooting crap:Alleged psychic John Edward actually gambles on hope and basic laws of statistics.". Salon.com. ↑ Ritchie SJ, Wiseman R, French CC (2012). "Failing the future: three unsuccessful attempts to replicate Bem's 'retroactive facilitation of recall' effect". PLoS ONE. 7 (3): e33423. doi:10.1371/journal.pone.0033423. PMC 3303812 . PMID 22432019. 1 2 3 Melton, J.G. (1996). "Psychics". Encyclopedia of Occultism & Parapsychology. Thomson Gale. ISBN 978-0-8103-9487-2. ↑ Chevignard, Bernard (1999). Présages de Nostradamus. ↑ Lemesurier, Peter (2003). The Unknown Nostradamus. ↑ Melton, J. G. (1996). Dreams. In Encyclopedia of Occultism & Parapsychology. Thomson Gale. ISBN 978-0-8103-9487-2. ↑ Carroll, Bret E. (1997). Spiritualism in Antebellum America. Indiana University Press. ISBN 0-253-33315-6. ↑ Podmore, Frank (1997). Mediums of the Nineteenth Century. University Books. ISBN 0-253-33315-6. ↑ Melton. Chapter "Theosophical Society"
↑ McConnell, R.A., and Clark, T.K. (1991). "National Academy of Sciences' Opinion on Parapsychology" Journal of the American Society for Psychical Research, 85, 333–365. ↑ David W. Moore (June 16, 2005). "Three in Four Americans Believe in Paranormal". Gallup News Service. Retrieved 2008-10-08. ↑ "Paranormal Beliefs – An Analysis of College Students". ↑ Britt, R.: "Higher Education Fuels Stronger Belief in Ghosts" LiveScience, January 2006, Retrieved September 18, 2007. ↑ Chauran, Alexandra (2012). So You Want To Be a Psychic Intuitive. Llewellyn Worldwide. ISBN 0738730653. 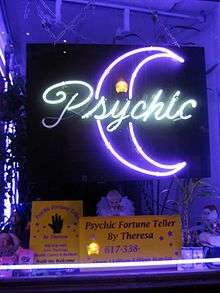 ↑ "Psychics – myths & misconceptions". Retrieved April 25, 2007. ↑ "Science and Engineering Indicators 2006". National Science Board. 2006. ↑ Hyman, Ray (1995). "Evaluation of the program on anomalous mental phenomena". The Journal of Parapsychology. 59 (1). Retrieved 2007-07-30. ↑ Akers, C. (1986). "Methodological Criticisms of Parapsychology, Advances in Parapsychological Research 4". PesquisaPSI. Retrieved 2007-07-30. ↑ Child, I.L. (1987). "Criticism in Experimental Parapsychology, Advances in Parapsychological Research 5". PesquisaPSI. Retrieved 2007-07-30. ↑ Wiseman, Richard; Smith, Matthew; et al. (1996). "Exploring possible sender-to-experimenter acoustic leakage in the PRL autoganzfeld experiments – Psychophysical Research Laboratories". The Journal of Parapsychology. Retrieved 2007-07-30. ↑ Moulton ST, Kosslyn SM (January 2008). "Using neuroimaging to resolve the psi debate". Journal of Cognitive Neuroscience. 20 (1): 182–92. doi:10.1162/jocn.2008.20.1.182. PMID 18095790. ↑ Shafer, R; Jadwiszczok, A. (2010). "Psychic defective: Sylvia Browne's history of failure". Skeptical Inquirer. 34 (2): 38–42. ↑ "Putting Psychics to the Test". Chicago Tribune. 2011-09-21. Retrieved 2011-09-12.